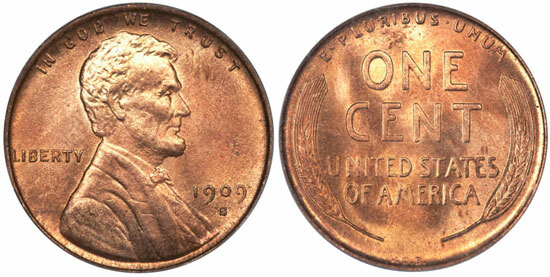 The 1909-S VDB Lincoln Cent is the famous key date coin created during the inaugural year of the Lincoln Cent series. The rarity was created by the removal of the designer Victor D. Brenner’s initials “V.D.B.” after as few as five working days at the San Francisco Mint. This issue has been popular since the public became aware of it, due to its perceived scarcity and its widely recounted back story. The Lincoln Cent was the replacement for the Indian Head Cent, which had been introduced 50 years earlier in 1859. The new series was released in 1909 to coincide with the 100th anniversary of the birth of Abraham Lincoln. The likeness of the 16th President was designed by Victor David Brenner, a Lithuanian immigrant who had created a bronze plaque in 1907 featuring a bust of Lincoln. The current President Theodore Roosevelt, who had sat for Brenner for a Panama Canal commemorative medal, liked the work of the artist so much that he chose the image of Lincoln from the plaque as the design for the new cent. The reverse design for the coin, which would also be designed by Brenner, featured two wheat stalks and required inscriptions. The designer’s initials “V.D.B” were placed on the lower reverse in capital letters. The design would be struck at the Philadelphia and San Francisco Mint for a very short period before it was decided that the designer’s initials were too prominent on the coin and they were removed. While it is often mentioned in numismatic literature that the public opposed the prominent placement of the designer’s initials on the coin, it has also been suggested that Chief Engraver Charles E. Barber opposed them strongly, as he did with other coin designs as well. Mintage for the 1909-S VDB Lincoln Cent halted at just 484,000 pieces. Virtually the entire amount was placed into circulation, although many were soon retracted when people realized the low mintage and potential of this issue. While the mintage of the coin is not an extremely low number in the absolute sense, survivors are popular, and trade for a strong premium above other Lincoln Cents of the same period. This issue has long been considered to be among the most famous and popular of all American coinage. As a result of the low mintage and short production run, virtually all examples are early die states, have a sharp strikes, and excellent eye-appeal. Obviously, exceptions exist, but finding a problem-free 1909-S VDB Lincoln Cents shouldn’t be too difficult. Thanks to early hoarding and retraction from circulation of this issue, virtually all grades are usually available, from well-circulated, up to gem mint state with original red color. It is difficult to estimate the total number of survivors of this issue, as hoards or accumulations might still exist, but a reasonable number of the original mintage probably still survives. Some estimates put to figure as high as 400,000 pieces, although this number appears to be a bit on the high side. It is safe to say that at least 150,000 1909-S VDB cents survive in all grades. The finest 1909-S VDB Cents that have been graded by PCGS are nine MS-67RD pieces, with a single NGC coin that has received the same grade. These are irregularly sold at auction, and one of these sold for $ 97,750, in 2006. In Red-Brown, often representing excellent value, the highest graded coins have been certified as MS-66RB. With the coloration designated as brown, the finest are PCGS or NGC MS66BN. The value of circulated examples of the 1909-S VDB Lincoln Cent start at approximately $500 for a barely recognizable coin to many multiples of that in the higher circulated grades. Careful examination of both circulated and uncirculated coins is needed to select problem-free examples in all grades. Due to its steady popularity, prices for this key date Lincoln Cent have risen steadily over the decades, almost continuously since they first appeared in the channels of commerce in the San Francisco area.